Cambridge has many great restaurants, but there's not much on MIT campus. I tried my share of Anna's Taqueria, the food trucks (which are too far to be my daily lunch), and the food court at the student center. Nothing worth seeking out. 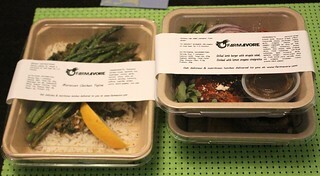 Farmavore delivers homemade lunches made with local, sustainable ingredients to your office. The founders actually started out as farmers, so they're committed to supporting local farms. They delivered a couple of lunches for me to try (OK, to my home because sometimes I go to work really late ....). 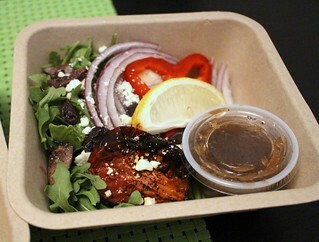 The lunch boxes are labeled with the menu and how to reheat them (and the calorie count, if that's important to you). The first was a Moroccan chicken tajine with rice. 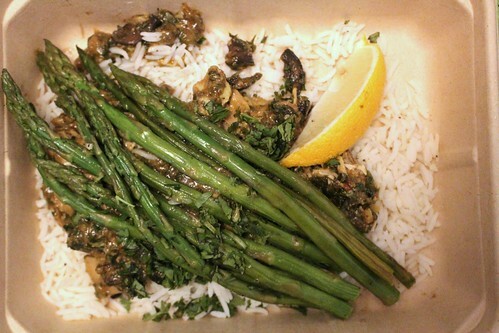 As promised, the meal tastes homemade, with fresh asparagus and tender chicken. The chicken had a lot of flavors but not overly salty, I thought it was quite healthy. The portion was just right, as well, not too big, but enough to maintain your energy. 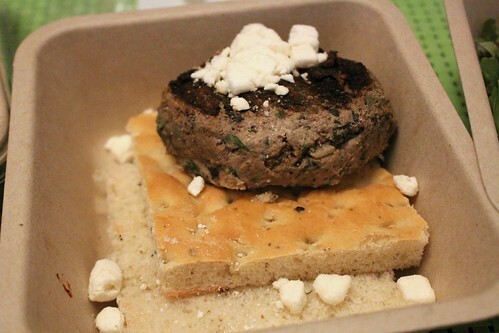 The other dish I tried was a lamb burger with feta on focaccia bread and a side of salad. I thought it looked small at first but the thick, juicy patty and the bread filled me up. I actually stored this for a day and the bread maintained its moisture well. The menu is pre-selected by Farmavore, but based on what I had, I think you will enjoy whatever they send, and you can also give feedback so they'll learn your preferences. Farmavore currently delivers in Massachusetts, Connecticut, and Rhode Island. The price of the meal, which includes delivery, depends on how often you get the meal. If you order 5 times per week, then it's $10/meal. 3x/week will bring up the meal to $12 and a once a week meal would be $14.